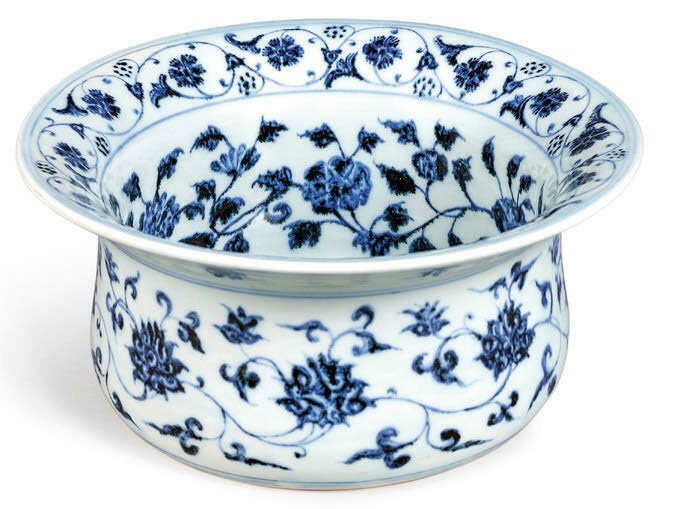 An early Ming basin that sold at HK$28m ($2.7m) at Sotheby’s Hong Kong. Traditional Chinese works of art contributed HK$634m (£61.5m) led by the April 3 white glove sale of 18 Ming and Qing porcelains from the Tianminlou collection. Considered the greatest assemblage of imperial blue and white in private hands, it was amassed by Hong Kong collector Ko Shih Chao (1911-92) from the 1950s. Highlights included a 10in (25cm) early Ming basin, one of the many strikingly shaped and decorated vessels of Islamic inspiration developed by the imperial kilns of Jingdezhen in the Yongle period (1403-24). Bought from New York dealer JJ Lally in 1986, it was estimated at HK$8m-12m but hammered at HK$28m ($2.7m) plus buyer’s premium. Asian private collectors bought every lot in the Tianminlou sale for a premium-inclusive total of HK$194m, close to three times the low estimate. A Yongle or early Xuande (1426-35) blue and white jarlet. 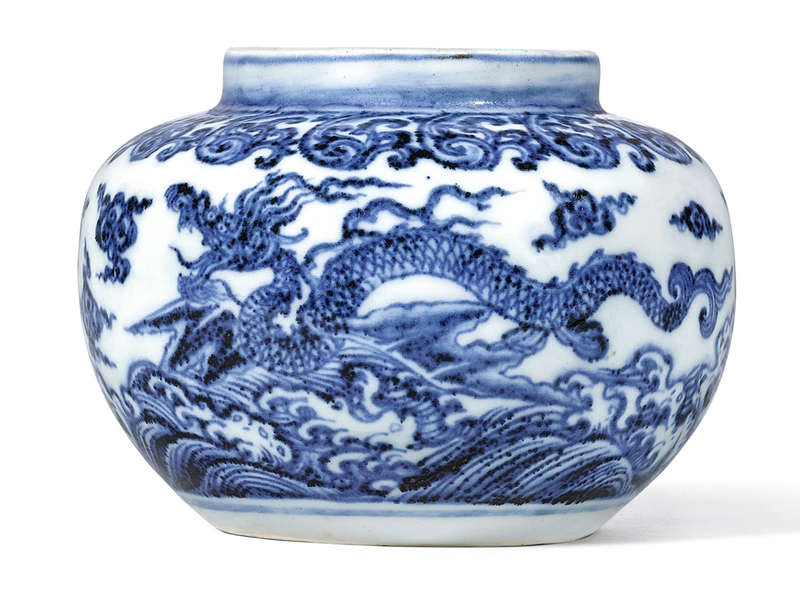 Sold at HK$22m (£2.14m) was a Yongle or early Xuande (1426-35) blue and white jarlet, just 41/2in (11cm) across, painted in rich tones of cobalt blue with a pair of winged dragons riding on waves. Previously in the collections of both Edward T Chow (1910-80) and TY Chao (1912-99), this piece, a rare design and form for this period, was last sold at Sotheby’s Hong Kong in May 1987. A textbook 12in (30cm) ‘dice bowl’ decorated with Indian lotus decoration, acquired by Ko Shih Chao at Sotheby’s London in June 1986, sold at HK20m (£1.94m). It carried the six-character reign mark Daming Xuande nianzhi (made in the Xuande period of the Great Ming dynasty).